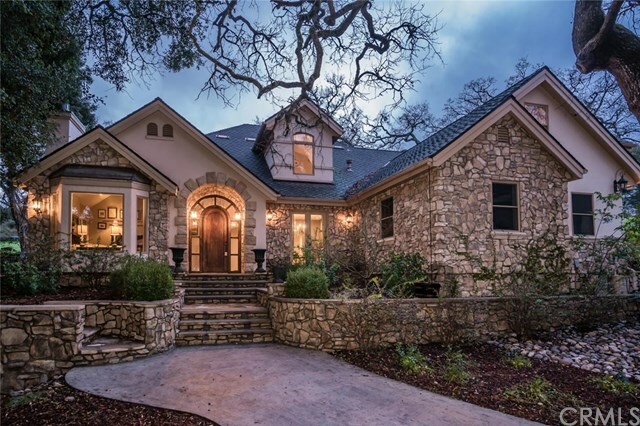 Set amongst the oak trees of West Atascadero, this exquisite 3636+- sq. ft. private estate is your dream come true. It offers privacy and grandeur as well as comfort and impeccable design. Itâs all in the details. As you walk in the front door you are met with a sweeping staircase and lofty ceiling. To the left is an office with French doors and oversized windows to view the hillside and a gas fireplace to keep it cozy. There is also a full guest bathroom and then the master suite, which is accessed through a sitting room and features French doors, a generous walk-in closet, and elegant bathroom. To the right of the staircase is a formal dining room, wine cellar, butlerâs pantry, laundry room, and Chefâs kitchen with a breakfast nook. The kitchen opens up to a large family room with an oversized fireplace that offers a warm hearth to inspire conversations and cathedral ceilings. This room, too, offers French doors and large windows that let the outside in. The upstairs is perfectly laid out and boasts 3 sizable bedrooms, yet another sitting room, and a spacious bonus room. The backyard is ideal for entertaining or hosting special occasions and includes a marvelous oak-studded hillside. Showings are by appointment only, call your Realtor today to schedule. This is NOT a drive-by!